Bailer-Jones and his colleagues found four stars that are possible candidates for ‘Oumuamua’s home world. All four of them are dwarf stars. The one that came closest to 'Oumuamua, at least about one million year ago, is the reddish dwarf star HIP 3757. It approached within about 1.96 light-years. Given the uncertainties unaccounted for in this reconstruction, that is close enough for 'Oumuamua to have originated from its planetary system (if the star has one). 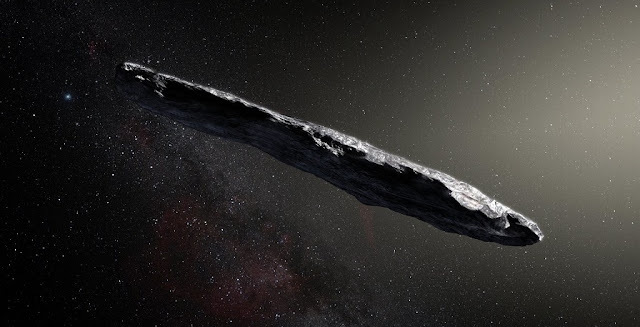 However, the comparatively large relative speed (around 25 km/s) makes it less probable for this to be ‘Oumuamua’s home. The next candidate, HD 292249, is similar to our Sun, was a little bit less close to the object’s trajectory 3.8 million years ago, but with a smaller relative speed of 10 km/s. The two additional candidates met 'Oumuamua 1.1 and 6.3 million years ago, respectively, at intermediate speeds and distances. These stars have been previously cataloged by other surveys, but little is known about them.